Description: Q159 westbound at Amsterdam with a friendly wave! Description: Q100 eastbound climbing the Rotterdam grade. Seen here at Lower Gregg Rd. Description: Q282 has just crossed Tired Creek and is heading north to Dothan, AL. Description: After waiting for the 2 Septa trains to clear, Q190 gets a move on as it comes through the NTC on it's way out of Abrams, the power being a pair of GEVO's. 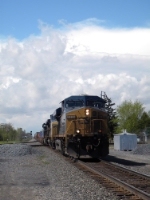 Title: Q173 racing southbound at "Rock Quarry Rd"
Description: 5342 hauling through Fostoria around 11 am on the 19th. Description: SB CSX pig train passes AT terminal. Description: Either freshly washed or painted...look how shiny it is. Description: Eastbound train Q032 with locomotive 5342 leading is between the signals at Rossville interlocking, Philadelphia Subdivision. Description: Q032 crosses Rail Ln at Singerly. Description: A SD70AMC leads two GEs on this eastbound stack train at QC 309. Description: CSX Q604 power move. Description: A westbound doublestack in Schuyler, NY on July 11, 2012. Description: CSX trailer train passing through Iona Island. Description: CSX lash up sideview.